Born in 1832, Louisa May Alcott was raised in a poor family with much love and grew up to become a beloved writer. Do you know what her life was like? What was it about her father that caused him to lose his teaching job? How did Louisa and her 3 sisters have so much fun together? When did she begin to write her stories? How old was she when her first story was published? What are her most famous books? In this beautiful picture book biography of Louisa May Alcott, you will see how the difficult parts of her life gave her memories that became the clay to mold her character first and then her books. Bethanne Andersen's bold and dramatic illustrations set the mood of the time. Some of her quotes and early poems are included to help you to get to know her. You will even find her favorite yummy recipe, New England Apple Slump! On the last page, the author includes a timeline of the life of Louisa May Alcott and a biography for further reading. 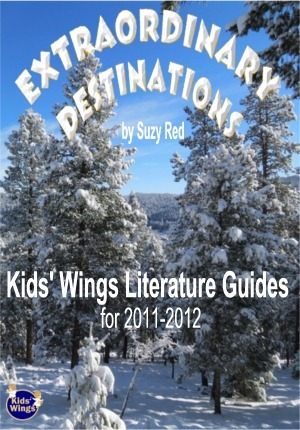 The Kids' Wings literature guide invites group discussion, prediction, drama, problem-solving, and skill-building. Teachers who want students to get to know this famous writer will want make this intermediate-level picture book part of their classroom libraries. A 9-page paired unit perfect for lesson planning, handouts, or projection on your SmartBoard for Louisa: The Life of Louisa May Alcott is now available! Crossword Puzzle: Who? What? Where? When? Why? Louisa: The Life of Louisa May Alcott is one of the 26 literature guides for award-winning literature in our Extraordinary Destinations Collection. Though you can order each unit individually for about $12.95, if you order Extraordinary Destinations you will get the 26 units for less than $1.00 each in a spiral-bound book with CD in its back pocket! Order now while quantities last! by Yona Zeldis McDonough NOW!